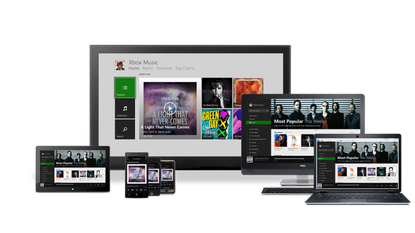 Microsoft is expanding its Xbox Music service to iOS and Android devices, and also adding free streaming via the Web. Starting Monday, users can get unlimited access to the songs and artists on tablets and smartphones running Android and iOS, as well as ones based on Windows 8 and Windows Phone, for US$9.99 per month or US$99.99 per year, Microsoft said. The support for Google's and Apple's OSes is still under development, and in the coming months additional features will be added, including an offline mode that lets users listen to music without an Internet or data connection as long as they downloaded it in advance. Microsoft expanding its music service to Android and iOS makes sense, because of the popularity of the two platforms, according to Paolo Pescatore, analyst at CCS Insight. "Music has been an Achilles heel for Microsoft. It is area it has dabbled with in the past, and hasn't had any real success so far. This is the latest attempt to strengthen its presence," he said. But convincing users to choose its service over the likes of cross-platform services like Spotify, Rdio, Deezer as well as Google Music or Apple's iTunes Radio won't be easy. "That will be a huge challenge. ... I think if this ultimately fails, the next step would be an acquisition of a leading provider," Pescatore said. As part of Microsoft's effort to make its music service more popular, the company is also adding a free online streaming service that will work on Windows 8 tablets and PCs. The free version is ad-funded and will be limited to 10 hours per month after 6 months, according to the fine print on the service's website. It too will be upgraded in the coming months: Microsoft said it plans a Radio feature that will allow users to choose between different channels, but not the songs the service will play. The company's developers are also working on a new Web Playlist tool. The tool scans all the artists and music available on a given Web page and creates a custom playlist of all that music. It will become available along with Windows 8.1, and will be released Oct. 17, according to Microsoft.